In this post, please enjoy two recent art reviews from New York and Philadelphia at Whitehot and Artblog and an interview at BUST! "Landscapes Get Wonderfully Complicated at NYU's Grey Art Gallery." Whitehot Magazine of Contemporary Art, May 21, 2018. "While the wall text of Landscapes After Ruskin nods to the idea of our living in the Anthropocene era, in which the world around us is now largely shaped by human events and actions, the idea of the depiction of a landscape to be seen by others is in and of itself a bit Anthropocene. Even in a photograph, even in the most faithful painting or drawing recreation of anything in the field of vision, there’s always going to be the human impact of the artist’s intent that shapes not only what we see, but the mere fact of how we see it in the first place. On the whole, we as viewers don’t receive these landscapes directly, because we aren’t experiencing them in person: we receive them only after other humans (artists) have done with them what they will, in order to make them into something they want to show us." "Queer forms on display at Grizzly Grizzly’s 'Two Spiders'." Artblog, May 25, 2018. "In a two-person show like this one there’s a tendency, at least on my end, to compare and contrast: to see how each artist uses their own works, mingled amongst each-other, to create a coherent narrative or satisfying rhythm. With regards to Two Spiders, then, I found that each artist brought something totally different to the table: while Harrod’s sculptures and drawings were cheeky and raunchy in glorious technicolor, Bogia’s large-scale sculpture and three small, deceptively-simple drawings cohesively “queer” the forms depicted in them." "'RBG's' Film Editor On How The All-Women Crew Told Ruth Bader Ginsburg's Story." BUST Magazine, May 30, 2018. 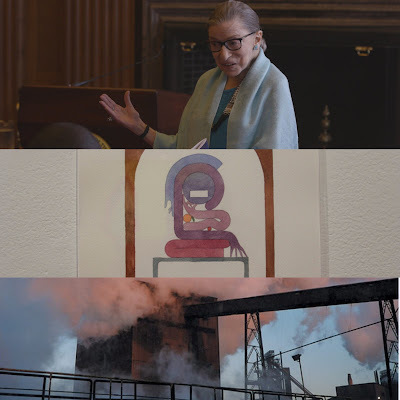 "Q: What do Ruth Bader Ginsburg and her work and legacy mean to you? How did your view of her change during the making of? "A: I was familiar with her through her dissents and through her reputation on the internet—the “Notorious RBG.” Betsy and Julie told me a little more when we met, but once I really learned about her life and her early career, it was a revelation to me. I was filled with gratitude for what she did for women’s rights. I didn’t know everything about her when I came on, but I think that when you’re editing, it’s actually helpful to start with fresh eyes. It was a really great experience learning about her and all the work that she’s done."